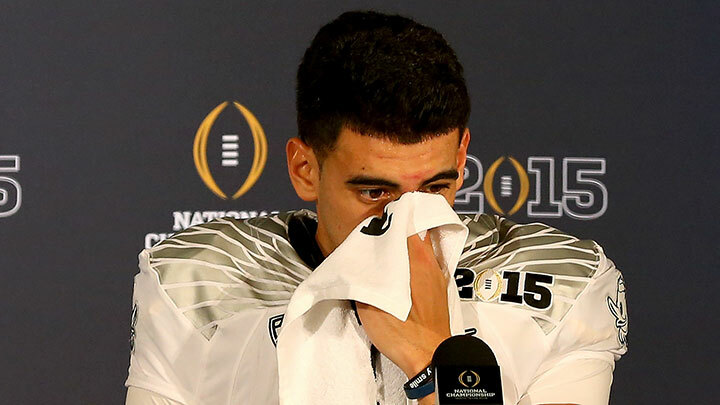 » How Far Will Marcus Mariota Fall Before the NFL Draft? How Far Will Marcus Mariota Fall Before the NFL Draft? For the entire college football season — literally, from the beginning to the end — Marcus Mariota was the next great quarterback prospect. He could throw, he could run, he could decipher a placard decorated with Jim Rome’s face and a fat chipmunk at speeds that’d make Fibonacci blush, and, well, he had character. With the highest level of the sport moving, however slowly, toward accepting the spread principles of the Oregon offense, and with the NFL increasingly dominated by mobile quarterbacks, it seemed a given that Mariota would be the no. 1 pick come April. 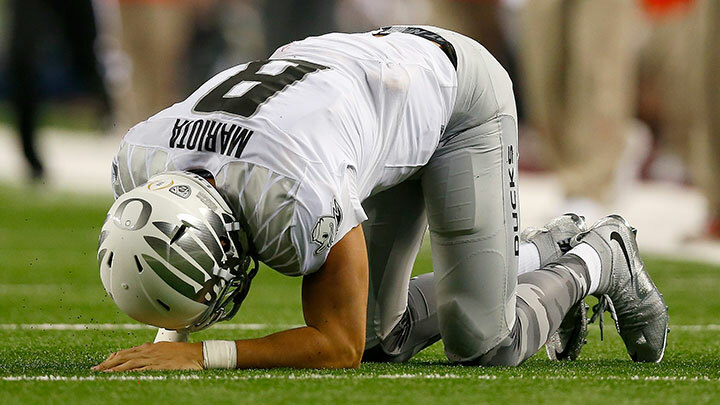 But, as noted NFL draft theorist Francis Bacon once said, “If a man will begin with certainties, he shall end in doubts.” And now, according to Todd McShay’s latest mock draft, Mariota is set to fall to no. 6 and be drafted by the New York Jets.1 Jameis Winston, who was last seen throwing a ball toward his own end zone in a fit of primal terror, is now the close-to-consensus no. 1 pick. Never mind that Mariota hasn’t actually played football since the beginning of January. Or that he threw for some 600 more yards, 17 more touchdowns, and 14 fewer interceptions than Winston. Or that Jameis Winston happens to be Jameis Winston. As Aaron Rodgers and Teddy Bridgewater have shown us in the past, even if you’ve proven — week after week, in actual, real, live football games — that you play the position of quarterback better than all of your peers by a significant margin, not everyone will believe that you can PLAY QUARTERBACK IN THE NATIONAL FOOTBALL LEAGUE. And as anyone who’s ever chased a wheel of cheese down a grassy hill knows, once you start tumbling, you won’t be able to stop. So, where will Mariota end up come the NFL draft? Despite an official draft status of “Gertrude Stein Has a Better Chance of Being Mr. Irrelevant,” Mariota is still invited to the event. A leaked league memo — made public when Roger Goodell, who was trying to order Domino’s with his phone for the first time, accidentally took out an ad in the Sunday Times — reads, “We need some drama re: the draft. I.e. 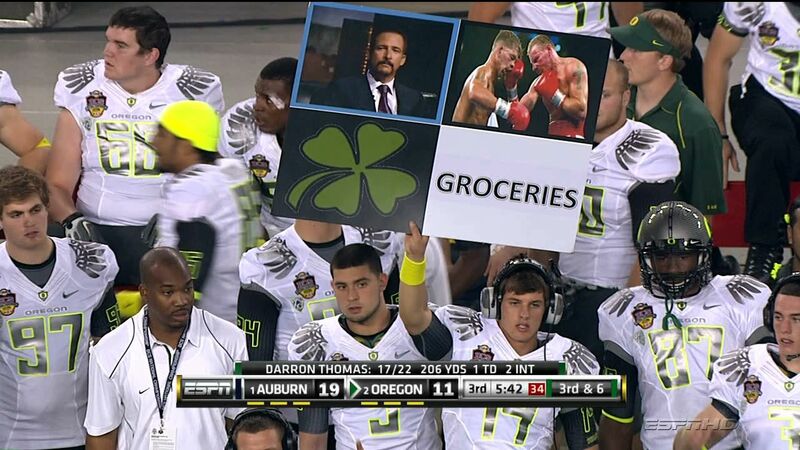 We need to humiliate a dumb college kid in an oversize suit in front of millions of people. Ha-ha. [Guy in a Russian hat emoji. ]” Mariota briefly stands up at the announcement of the 11th pick, but it turns out that the Vikings have, once again, used up all of their allotted time and sent in a folded napkin that reads “MARCUS MARIOTA … NOT” just to save face. Mariota is still sitting in the green room at the Auditorium Theatre in Chicago. There’s a little-known clause in the contract players sign when they accept an invitation to attend the draft: “You can’t leave until a team picks you.” Mariota hasn’t eaten in nearly two years. His beard is 17 feet long. His hair has congealed into five haphazard dreadlocks. His suit is now 15 sizes too big. He’s only survived because his body has evolved to the point where it’s able to process the enzymes in his tears. Players are allowed to bring phone chargers to the draft. WHAT DO YOU THINK THIS IS?